2016’s been an amazing year, with more Coffee Spots visited and written about than ever. The annual Coffee Spot Awards provides a chance for me to reflect on all the great places I’ve visited and to give them all some more well-deserved time in the limelight. As usual, there are 20 Awards, the shortlists for each being publishing between now and New Year’s Eve, the winners being announced on New Year’s Day. Thanks to everyone who’s visited the Coffee Spot, followed me on Twitter, liked my Facebook page, +1ed me on Google+ (a dwindling number!) and liked my pictures on Instagram. While I do this for the love of coffee, it means a lot to me that so many of you take the time to read and comment on my writing. Without you, it really would be pointless. This year I published Coffee Spots from various countries, adding China, Denmark and Portugal to the list for the first time, as well as venturing to new cities such as Phoenix. As I write, the Coffee Spot has over 130,000 views this year, up from 125,000 in 2015. This is an average of 360 per day (up from 340 per day in 2015). Over 70,000 of you have visited the Coffee Spot (up from 62,000 last year) from 144 countries (three up from 2015!! ), with 74% of you coming from the UK (down from 77% in the previous years). And, for the first time ever, more than 10% of my visitors are from the US. Anyway, enough of the numbers. Without further ado, let’s see what the award categories are this year. You can click on the Award title to see the shortlist. Regular readers with know that I have a soft spot for Coffee Spots with great basements, and this award recognises them. A good basement can be a real boon, particularly in the winter months, where there’s nowhere better to wrap up warm and cosy! Following the success of the Coffee Spot Lighting Calendar, it seems only fair that those Coffee Shops with wonderful lighting are properly recognised, hence this award. Espresso is tricky. 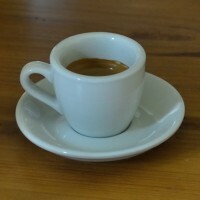 I still can’t pull a reliable shot at home and admire those who can knock out shot after shot of high-quality espresso. Although my appreciation of filter coffee has come on leaps and bounds, I still see espresso as the pinnacle of coffee and it’s the drink that’s most likely to make me go “WOW!”. This award is for those Coffee Spots which served me the best and most memorable espressos of the year. I have a special place in my heart for small coffee spots and this year the Coffee Spot continued to be full of them. Note that this is all subjective – I did not get my tape measure out at any point! While the Coffee Spot is mostly about places to have coffee, I drink the majority of my coffee at home. This award recognises those wonderful who roast and sell me my coffee beans. So far the Coffee Spot has made it to North America, France and Dublin, with 2016 seeing first ever visits to Copenhagen, Portugal and China. I know it’s not quite the rest of the world, but I’m getting there. This award celebrates the best Coffee Spots from outside of the UK. Finally, this is the only award not decided by me. It’s given to the Coffee Spot which received the greatest number of views (according to JetPack) in this calendar year. Since the Awards are meant to recognise what’s happened on the Coffee Spot this year, I’ve decided to exclude Coffee Spots published in previous years.